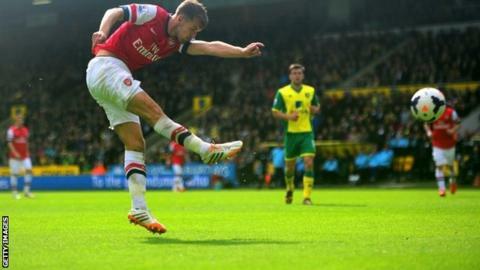 Norwich City's relegation from the Premier League was confirmed as a stunning Aaron Ramsey strike spurred fourth-placed Arsenal to victory. The Canaries were all but down before kick-off, and Ramsey's volley on the angle and Carl Jenkinson's opportunistic strike sealed their fate. Earlier, Norwich keeper John Ruddy had to be alert to keep out Lukas Podolski and Olivier Giroud. Gunners keeper Lukasz Fabianski denied Jamar Loza and Robert Snodgrass. It was a sombre finish to a disastrous season for Norwich, who could only have survived if they had won and West Brom had lost to Stoke, coupled with a highly improbable 17-goal swing. Whether Neil Adams starts next season's Championship campaign in charge is yet to be seen, after the former youth coach had the unenviable task of trying to keep City up following Chris Hughton's sacking with five games left. Striker Ricky van Wolfswinkel, the £8.5m signing whose only goal this season came on the opening day, was conspicuous by his absence from the squad. There was good news for England fans the day before Roy Hodgson names his World Cup squad as Arsenal's Jack Wilshere returned after a foot injury for the final 30 minutes, while knee injury victim Abou Diaby also came on for the Gunners in his first game in 14 months. But it was Ramsey, also returning from injury, who shone for the visitors, rifling in a superb volley from Giroud's delicate chip to the back post. It was the Welshman's 17th goal of an injury-disrupted season, and fans will wonder if Arsenal's title challenge, which looked promising until February, would have flourished had he not missed so much football. Arsenal went into the game with a Champions League spot already secured and with the prospect of a first trophy for nine years still to come in next week's FA Cup final, and a strong Gunners side rarely had to rise above second gear at Carrow Road. After Ramsey's opener, Jenkinson grabbed his first Arsenal goal, pouncing on Podolski's deflected shot from Kieran Gibbs's cross. Norwich never wilted, and debutant Loza stung Fabianski's fingers while the Polish keeper had to be quick off his line to close down Snodgrass. But City face a summer of upheaval if they are to mount a challenge to make an immediate return to the top flight. Arsenal boss Arsene Wenger: "Unfortunately it's the first time in the Premier League that you finish fourth with 79 points and it was very tight. "We can be frustrated. We have won 11 games away from home, I think it's the best in the league and it was our 17th clean sheet - that is remarkable as well. "We just wanted to finish the season well and we did it in a serious way, so it is a good basis to prepare for the FA Cup final." Match ends, Norwich City 0, Arsenal 2. Second Half ends, Norwich City 0, Arsenal 2. Corner, Arsenal. Conceded by Russell Martin. Attempt saved. Elliott Bennett (Norwich City) right footed shot from outside the box is saved in the centre of the goal. Jamar Loza (Norwich City) wins a free kick in the defensive half. Attempt saved. Yaya Sanogo (Arsenal) left footed shot from the centre of the box is saved in the bottom left corner. Assisted by Jack Wilshere. Attempt saved. Jack Wilshere (Arsenal) right footed shot from the centre of the box is saved in the bottom left corner. Assisted by Mesut Özil. Corner, Norwich City. Conceded by Lukasz Fabianski. Attempt saved. Robert Snodgrass (Norwich City) right footed shot from the centre of the box is saved in the centre of the goal. Assisted by Gary Hooper. Attempt missed. Robert Snodgrass (Norwich City) right footed shot from the right side of the box is close, but misses to the left. Assisted by Russell Martin. Attempt saved. Mikel Arteta (Arsenal) right footed shot from outside the box is saved in the bottom left corner. Ryan Bennett (Norwich City) is shown the yellow card for a bad foul. Yaya Sanogo (Arsenal) wins a free kick in the attacking half. Attempt saved. Elliott Bennett (Norwich City) right footed shot from the centre of the box is saved in the bottom left corner. Assisted by Robert Snodgrass. Attempt saved. Jamar Loza (Norwich City) right footed shot from the right side of the box is saved in the top left corner. Assisted by Gary Hooper. Substitution, Norwich City. Elliott Bennett replaces Nathan Redmond. Substitution, Arsenal. Vassiriki Abou Diaby replaces Tomas Rosicky. Corner, Norwich City. Conceded by Bacary Sagna. Goal! Norwich City 0, Arsenal 2. Carl Jenkinson (Arsenal) right footed shot from the centre of the box to the bottom left corner. Attempt blocked. Lukas Podolski (Arsenal) left footed shot from the centre of the box is blocked. Assisted by Kieran Gibbs. Attempt missed. Nathan Redmond (Norwich City) right footed shot from outside the box is high and wide to the right. Assisted by Jonny Howson. Substitution, Norwich City. Jamar Loza replaces Alexander Tettey. Substitution, Norwich City. Gary Hooper replaces Johan Elmander. Goal! Norwich City 0, Arsenal 1. Aaron Ramsey (Arsenal) right footed shot from the right side of the box to the top left corner. Assisted by Olivier Giroud with a cross. Attempt missed. Lukas Podolski (Arsenal) header from very close range is just a bit too high. Assisted by Bacary Sagna following a corner. Corner, Arsenal. Conceded by Michael Turner. Johan Elmander (Norwich City) wins a free kick in the defensive half. Second Half begins Norwich City 0, Arsenal 0. First Half ends, Norwich City 0, Arsenal 0. Offside, Norwich City. Robert Snodgrass tries a through ball, but Johan Elmander is caught offside. Attempt blocked. Robert Snodgrass (Norwich City) left footed shot from outside the box is blocked. Assisted by Russell Martin.